Technically, city council isn’t supposed to be a team sport. It’s supposed to be non-partisan — no (R) or (D) next to the names. But new Valley council candidates Dean Grafos, Bob McCaslin, Brenda Grassel, Tom Towey and incumbent Gary Schimmels all ran together under the same “Positive Change” slogan — and all won. When the dust cleared, only two of the old guard — Bill Gothmann and Rose Dempsey — remained. Which left the question: Would the new majority get along with the old minority? “Senator McCaslin, I’m looking forward to working with you on the council,” Gothmann claims to have said the night the council members were sworn in. “‘I think there are things we can work together on.’ He says, ‘Well, that won’t happen.” McCaslin could not be reached for comment. During the election, the “Positive Change” crew met regularly met at Yoke’s Fresh Market for coffee. Once they were elected, the meetings continued. 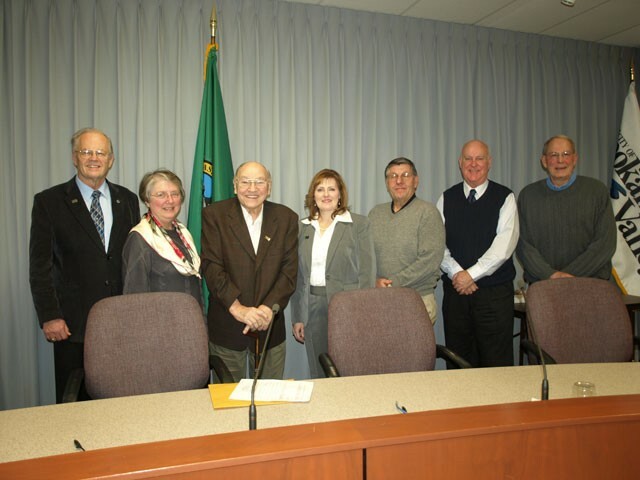 If there were a quorum — four council members meeting simultaneously — or if council business were discussed, the coffee shop meetings would violate Washington state’s open-meeting laws. At the first meeting, Gothmann’s frustrations grew. A last-minute addition appeared on the agenda: The requested resignation of Dave Mercier, the city manager. “They did it in such a matter that not one of the citizens in Spokane Valley were told ahead of time this would occur,” council member Bill Gothmann says. Grafos says it was a mistake — the staff was supposed to put it on the agenda earlier. But Gothmann says the new council violated several principles governing council conduct: No surprises. And keep it civil. “There was a remark made by Senator McCaslin toward me [during the first meeting]. It was not a civil remark,” Gothmann says. “Something like, ‘I know Bill speaks well, but he speaks too long.’” Of course, there’s an even bigger issue for the new council members: You just got control of Spokane Valley. What are you going to do now? Grafos is a bit mum. He doesn’t want to comment too deeply on the issues, he says, until he has a better handle on them. “I really don’t want to air these issues in the newspaper,” Grafos says. Most of the disincorporation leaders know Jackson well. “We’re all old friends — we’re all old Valley people,” Jackson says. They still keep in contact, she says, though not for political reasons. When the disincorporation effort flopped, the disincorporation team threw its political weight behind the incumbent-busters. Jackson — a volunteer for the Democratic Party for more than 40 years — found herself putting out ads for Republican Sen. Bob McCaslin’s council campaign. Grafos, Gothmann says, was a major donor to the disincorporation cause. But calling the new council “disincorporaters” — as one Spokesman-Review Web comment put it — is inaccurate, Grafos says. His donations, he claimed, were merely to support the right of the people to vote on the issues. Grafos, at least, says he’s open to working with Gothmann — though he’s not likely to always agree with him. “My biggest goal for the city is to bring the city together so we are a community,” Gothmann says. Of course, Gothmann can’t do much without help from the “Positive Change” crew.